If you are looking for a wide selection of bottle jacks, you have found the right place. We have a wide variety of options from the most trusted brands on the market. We offer selections from Norco, Sunex, OTC, Omega, ATD and more. Need help deciding on the right bottle jack for you? Please call our product experts at 1-800-647-7883. 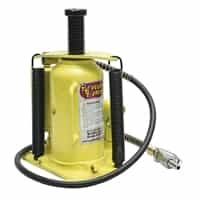 If you are looking for an option for your professional garage, you need a jack with a variety of options, so that you can use if on multiple vehicles. If you want something for personal use in your home garage, you can pick an option that will work the best with your own automobiles. We offer a variety of great choices. The Norco 12-Ton Capacity option, for example, is a great option for heavy duty use. On the opposite end of the spectrum, the ATD 2-Ton Hydraulic option is great if you want something smaller and simpler for at home use. If you take a look through our array of bottle jacks, we know you will find exactly what you need. 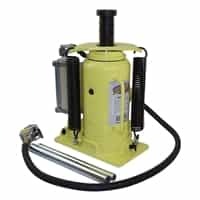 If you have a project but are not sure what size bottle jack you need, come into one of our locations or give us a call. One of our staff members would be happy to help you find the right option for your needs. At Best Buy Automotive, our customers are our number one priority. Because of this, we are always ready to help you figure out what you need for your latest project. This is also the reason that we strive to offer only the highest quality products from the best brands while keeping our prices affordable. If you compare our prices to other retailers, you will realize how competitive they are. If you are worried about coming up with the cash for a needed item, do not worry. We offer 6 month 0% interest financing, so you can get what you need without paying interest. There is a reason that we have been in business since 1987. We treat our customers with respect while helping them find the best products for their needs.